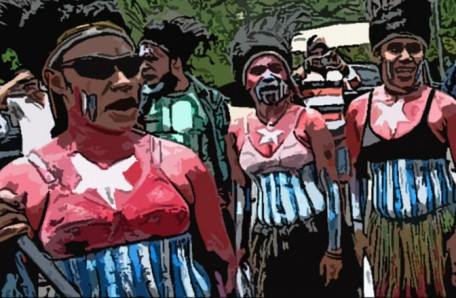 West Papuan women are the silent backbone of West Papua’s historic struggle for freedom and self-determination, and this seminar is an effort to match some of their faces with an array of political activism and resistance. The afternoon of camaraderie and sharing stories, in the Federal Republic of West Papua office in Docklands, culminates, as our open days usually do, with freshly cooked afternoon tea. MARJORIE THORPE is from the Gunnai and Maar Nations of Southern Victoria, and is currently studying law at the Koori Institute of Education at Deakin University. She is an experienced Aboriginal activist, committed to self-determination and Aboriginal sovereignty, particularly in areas of health, child welfare, women’s issues, and community development. BABUAN MIRINO is a West Papuan woman living in Australia, and will bring to her talk about the women’s organisation that she formed in West Papua after the Biak Massacre in 1998, the extra perspective of living in exile as a political refugee. Babuan is Co-founder of the FRWP Women’s Office in Docklands, and is an accomplished diplomat, singer, designer, chef, racconteur, and great-grandmother of ten little Papuans. IZZY BROWN coordinated the Freedom Flotilla of Australian and Papuan Elders in 2013. The flotilla carried a small bottle of sacred water from the Australian heartland to the coast of West Papua, re-establishing relations disrupted by rising seas at the end of the last Ice Age six thousand years ago. Izzy is talking about women activists she met in West Papua, and is showing her interview with one of the nation’s heroic freedom fighters. LOUISE BYRNE is an activist-academic who worked for East Timor’s liberation, and since 1999 for West Papua’s freedom and self-determination, while her PhD West Papua-tensions and contradictions in the transition to independence moves inexorably towards completion. She introduces West Papuan activists in Manokwari (on the north coast), and in Merauke (south coast); as well as Leonie Tanggahma, the only woman in the United Liberation Movement for West Papua committee that won the nation Observer Status in the Melanesian Spearhead Group in June 2015.